BANGI, 25 May 2012 – Lack of political will and courage may be hindering the proposed amendments to Family Laws which would clarify provisions on child custody cases. 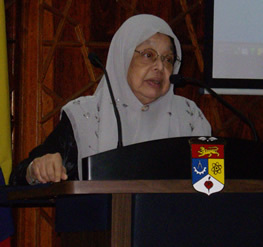 The legal consultant for United Nations agencies and former Commissioner with the Human Rights Commission of Malaysia (SUHAKAM), Adjunct Professor Datin Dr Hajah Mehrun Siraj said despite numerous conventions and meetings between the government, non-governmental organisations (NGOs) and legal practitioners, there seems to be no satisfactory solution to the rising number of child custody disputes, especially between Muslims and non-Muslims. Dr Mehrun said proposals to the changes had been forwarded to the Attorney-General’s chambers but has yet to be followed up by the cabinet. Giving her first lecture on ‘Conflict of Laws in Child Custody Cases’ at The National University Of Malaysia (UKM) here today, she said she had often been told by cabinet ministers that Family Law is about disputes between individuals and that the government was giving attention to other more pressing issues. Dr Mehrun admitted that the matter can divide public opinion and is very sensitive, thus putting the federal government in a quagmire. She explained that Malaysia’s complex legal history has resulted in a dual system of Family Law with one set of laws and courts for Muslims and another set for non Muslims. The system works well when both parties in child custody cases belong to the same religion and are subject to the same laws and courts. However, conversions into and out of Islam may result in cases where one party is Muslim and therefore subject to Islamic Law and the Shariah Courts while the other party is a non-Muslim and subject to the civil laws and civil courts. A conflict of laws situation arises with the main issues being which court should assume jurisdiction in such a case and which law should be applied. Proposals made following several conventions and conferences had been submitted to the de-facto Law Minister, Dato’ Seri Nazri Aziz, who had recently pledged to set up a commission to examine them. She said this was to address the situation which prevailed following the introduction of Article 121 (1A) of the Federal Constitution in 1981 which made the civil courts redundant in cases over which the Shariah Court has jurisdiction. The intention was to ensure that the civil courts could no longer hear cases over which the Shariah Court has jurisdiction, thereby avoiding the conflict of decisions and the overruling of Shariah Court decisions by the civil courts. However, a spate of high-profile cases in recent years had caused discontent on both sides of the Muslim versus non-Muslim opinion divide, especially when they involved either spouse who had converted to Islam or vice-versa and wanted custody of their children who also must have the same faith as them. The circumstances leading to a conflict of laws arise because marriages in Malaysia are either Muslim or non-Muslim. Although some state Islamic Family Law Enactments allow the marriage of a Muslim man to a non-Muslim woman who satisfies the definition of Kitabiyah, or People Of The Book, this provision has not been used as the likelihood of finding a Kitabiyah in Malaysia is quite remote. Apart from this all Muslim and non-Muslim mixed marriages cannot be solemnised. Dr Mehrun cited the celebrated case recently of Dr Sharmala a/p Sathiyasseelam v Dr Jeyaganesh a/l C Mogarajah in which the judge held that the defendant husband’s conversion to Islam did not dissolve his Hindu marriage. It only provided the wife with a ground for divorce under the LRA. The result is that the Muslim convert is regarded as still being married to his/her non-Muslim spouse while the Muslim can legally marry again, but only to another person of the same faith. This means that the wife who refused to convert can continue raising the children who follow the religion of the father under an amendment to the law in 1999 giving equal rights over the child. The original law the Guardianships of Infants Act 1961 (GIA) says the father should be guardian of the child. Dr Mehrun said such laws could be bad for the children who are torn between their parents and would be living under different religious environments although legally they must be raised as Muslims only. The Law Professor called for the National Fatwa Council to look at such cases more seriously for the purpose of law reforms. Quoting from the Hadith, she interpreted that children who are minors can choose which parent they want to go to after a divorce even when one parent refuses to convert to Islam. Despite this, in 1989 the Selangor state government tried to pass a law which makes it automatic for minors to convert and follow the parent who becomes a Muslim. However, the fears and the ensuing uproar from the Opposition were somewhat allayed when the final draft stated that a minor must obtain the written consent of the guardian before he/she can convert to Islam. In another high-profile case of Tan Sung Mooi v Too Miew Kim in 1994, the Supreme Court had already decided that conversion to Islam does not allow a person to avoid any legal obligations under the non-Muslim marriage. The court decision sent out a strong signal that the Civil Courts had jurisdiction in cases where one party was a Muslim and the other not. Nevertheless Dr Mehrun asserted that the law must be clarified to ensure that the guardian or parent who has not converted has a say in how the child can be raised. She was firm in saying that the rights of the non-Muslim must be recognized.